The Sticky Pod Version 4.0 is a slim carrying case which easily slides into a jersey pocket, keeping all your ride essentials close at hand. Silicone grippers keep it secure as you ride. This small size accommodates an inner tube, two co2 cartridges, a small co2 inflator, tire levers, a compact multi-tool, patch kit, ID, credit cards and cash. 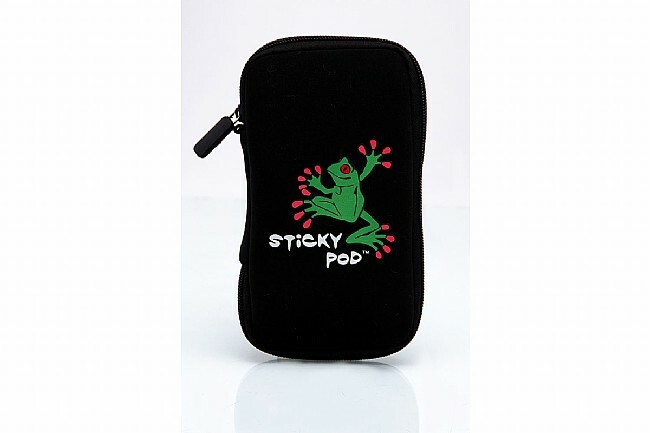 The Small Sticky Pod measures 7.5” x 4.25” inches and is flexible enough to fit a wide variety of items. Wanted a ride wallet to carry phone, cash, CC, etc. This fits the bill but the execution could be better. The transparent pouch zipper is difficult to pass things through (to small for an iPhone) and hard to get things out, especially if wearing gloves. The zipper would have been more helpful lengthwise. Great for shorter rides where one tube and accessories is enough. Easily fits in a cycling jersey pocket. I ended up switching to the chrome utility pouch, worked better and fit a small pump. It is a useful pouch for the minimum amount of items to carry. But the plastic zipper broke in half within a few uses, so the quality of that part of the product is poor. Zipper handle was broken within a few uses, so the plastic isn't tough enough. But otherwise I would recommend it. After a year of riding around with a repurposed diabetic testing supply pouch in the back of my jersey the zippers became corroded shut. This little manpurse has been the perfect replacement. It holds a tube, lever, and c02 infalter with ease, along with a $20 and my business card wrapped in plastic. I don't really know if the sticky nubs help at all - I actually ride with the frog-side against my spine as it has slightly more padding. But it doesn't matter. This thing fits in center pocket and gets the job done. Sticky pods are a ride neccessity!!! I own both the large and smaller sticky pod(s). For longer rides I employ the elongated sticky pod(s). Shorter rides call for the smaller pod(s). In both I'm able to insert credit cards, ID card, cash, patches, spare tire, house keys, tire changing tools, wrenches,etc. I used to carry these items carry in my 3 bib pockets. All these ride necessary accoutrements now fit in my sticky pod(s). Thus I'm organized, aerodynamic, and far more comfortable now that the contents are no longer weightily, ungainly occupying my three bib pockets. Too, my ride is now more comfortable since I no longer fill my three bib pockets with content. Instead, I'm able to put these ride necessities in my sticky pod(s). In addition, the silicon grippers serve as an adhesive while the pod (s) rests in one bib pockets thus preventing the pod for ejecting out of my bib pocket. For extremely long rides I use 3 sticky pods in my 3 bib pockets. YOU GOTTA' BUY MORE THAN ONE OF THESE RIDE NECCESSITIES!!! YOU WON'T REGRET IT. Despite the many cycling stores in San Francisco, I purchase all my cycling apparel, tools, etc at Western Bikeworks. Their prices and outstanding quality of merchandise is unbeatable. Ride safe. great for an allen wrench,tire levers,phone, and cash. No more plastic baggies for me. This little pouch holds all my important stuff, keeps the stuff dry and makes it easy to get what you want when you want it. Fits so easily in a jersey pocket. I will probably buy some more of these to use as gifts. I've grown a little tired of the pouches hanging beneath my saddle. Let's face it, a bike looks cleaner without a saddle bag! This Sticky Pod is a perfect alternative. It carries the essentials $20, tube, C02, chuck, and a few levers. Not much room for anything else, but what else do you need? I love this product! I use it on every ride, short or long. I keep it stocked with spare tube,CO2 cartridge, spare cash, and still have room for my IPhone. It's extremely lightweight, fits easily into a jersey pocket, and provides you with the security of knowing things you carry and need are zippered in and always with you. I have ordered several and given to fellow cycling friends as gifts! Bought this to store CO2 cartridges, inflator, ID, CC, etc. Works as advertised and I am glad I bought it. My smart phone, cash, credit cards, and front door key fit with room to spare. 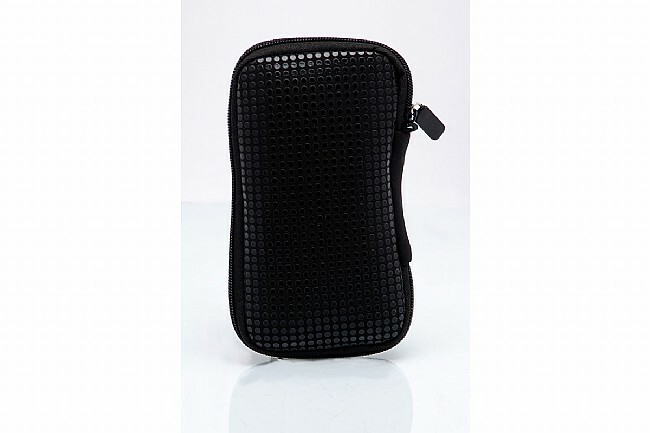 The extra zip pocket and mesh pocket keep things organized and its not too big. A little padding helps too. Effective carry all at the right price. I use this product as a bike bag to minimize weight and clutter on long rides. Fits jersey pocket well. The inside zippered pocket is great for ID too. Nice little case to hold the IPod and a few dollars when stuffed in your jersey pocket. I carry this on every ride and have for years now. So much better than a seat bag or ziploc. I carry a couple of Allen keys, tube, tire lever, co2 cartridge and Lezyne inflation head, cleat cover, cashcredit cardID. It holds my mobile phone, car key, spare cash and backup credit card for those rare emergencies. It stays in my rear jersey pocket and the rubber grips hold it in place over the roughest terrain. I don't know that I would bring it on an organized endurance ride like a century since I tend to travel without these items for such events, but it would work. Nice way to organize tunes, CO2 cartridges, etc. My only criticism is that it has a little too much bulk. Better than a seat bag! I've tried everything from seat bags and zip-lock bags and this Pod is just right!